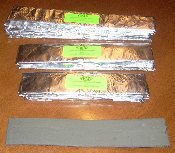 This is our 12 inch long by 1 1/2 inch wide fine grit loaded leather strop. These strops are loaded with the same product we sell in jars. But the compound is not smeared on it is hot potted in the same pot we brew our compound in. We drop these in when our compound is at full temperature and let them soak up the compound. And then when we pull them out we also sprinkle the top with fine grit silicone before it cools down. The leather has a course side and a smooth side. It is real leather not that old cardboard leather. These can be screwed down to your bench or a block of wood. The leather is pretty thick and a screw with a tapered head will sink down far enough into the leather to avoid blade contact. Many have even drilled a small hole in one end and hang it from a small but strong cord. And there is enough compound in these strops that the first time you use it scrape it good and save what comes off for the future. Copyright © 2008-2019 Leather Strop Compound. All rights reserved.